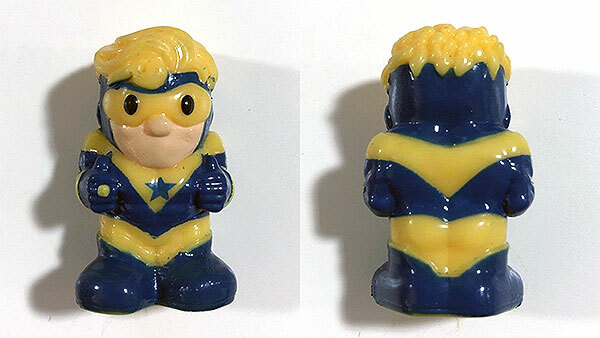 The Blot dropped by on Twitter to point out another unusual Booster Gold product, something called an "Ooshie." This is, apparently, the fourth wave of Ooshies pencil toppers, which means that I am very old and out of touch with... whatever is going on here. 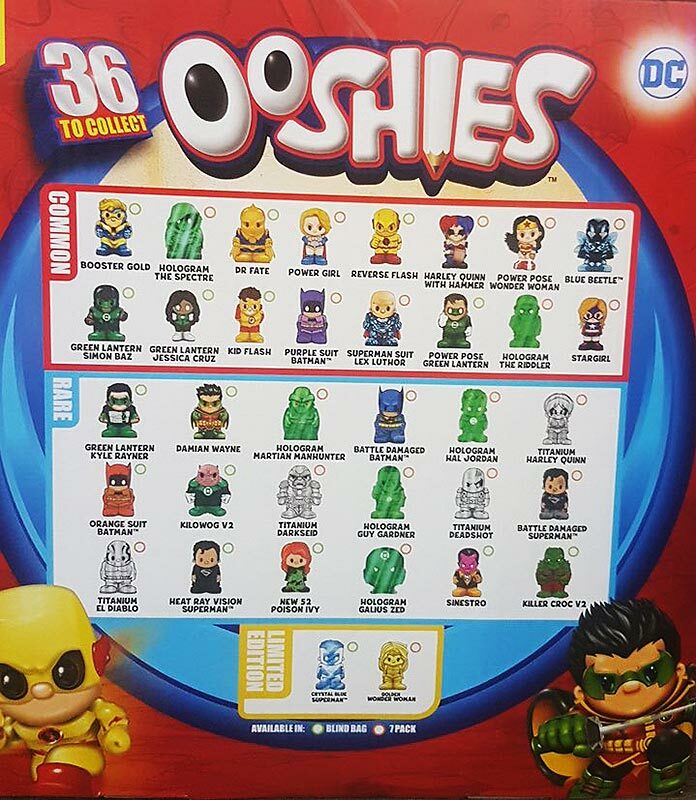 Ooshies are generally sold via blind bags, meaning you never know what Ooshie you might be buying and might spend forever hunting one down to find out what they really look like. Luckily for me, I live in the Internet age. Voila! 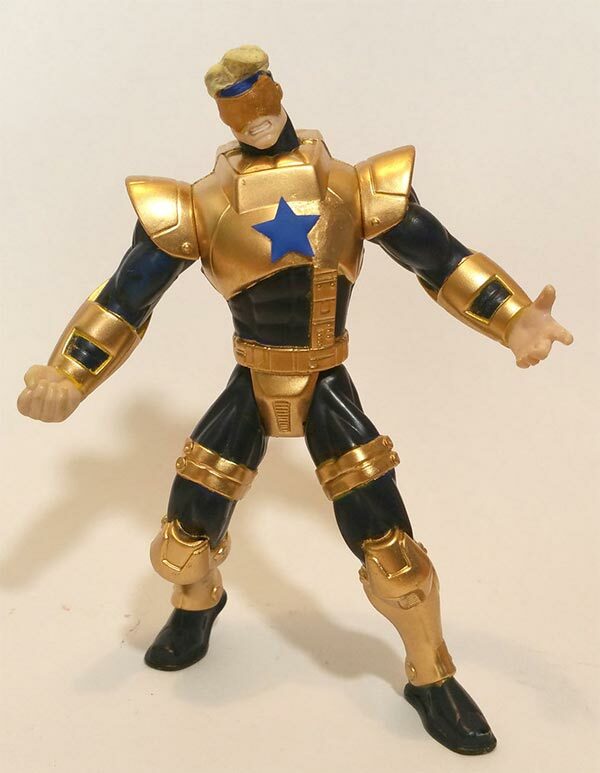 That image comes via eBay, where you can bid on your very Booster Gold Ooshie here. What a wonderful world. If you had three Booster Gold autographs and Booster gave you eight more, how many autographs do you have? I remember the figure this was made from! A Robot Fighters Cyclops figure from the X-Men line! If you had three Booster Gold autographs and Booster gave you ten more, how many autographs do you have? If Booster Gold travleled forward in time seven years and then traveled back two years, how many years forward is he now? I don't need to be an AFOL to recognize that Duo Le Pin's "Super Heroes" line is an unlicensed LEGO knockoff. 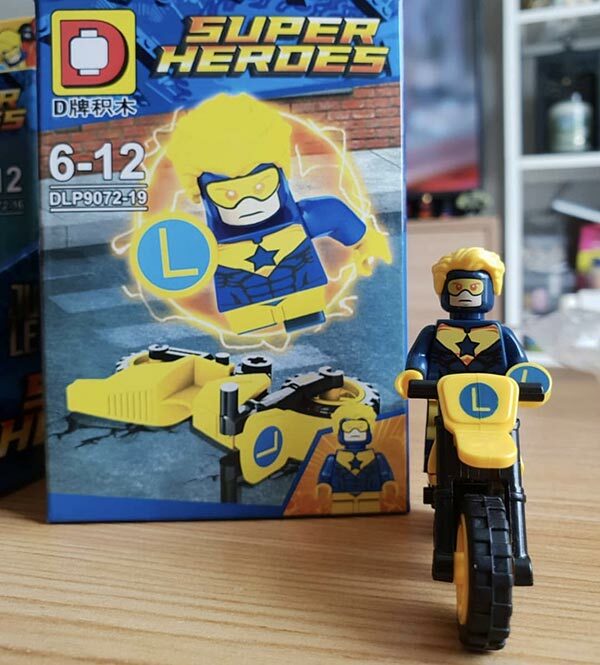 Therefore, no Booster booster should be too excited about item DLP9072-19, DLP's take on Booster Gold, complete with Legion Flight Ring... and his motorcycle? Thanks to The Blot for calling this out on Twitter. If you owned six Booster Gold comics and then bought nine more, how many total comics do you have? If Booster Gold had nine costumes and Doomsday destroyed four of them, how many costumes remain? March 2017: Target.com lists a 12-inch Justice League Action Booster Gold action figure. The price is $9.99, though the figure is listed as out of stock and cannot be ordered. June 2017: Target.com de-lists the figure. It hasn't been seen in stores and is presumed cancelled. December 2017: The figure appears on eBay.com, proving it exists. The listing closes over $100 for what appears to be an ultra-rare action figure. January 2018: The figure appears on Amazon.com, finally making it available to the masses. List price starts at $13. At last check, it was selling only from second-hand sellers with prices in the neighborhood of $25. Now: The figure has been spotted (and purchased) in Target stores in Dallas, TX and Philadelphia, PA. The purchase price is $9.99. 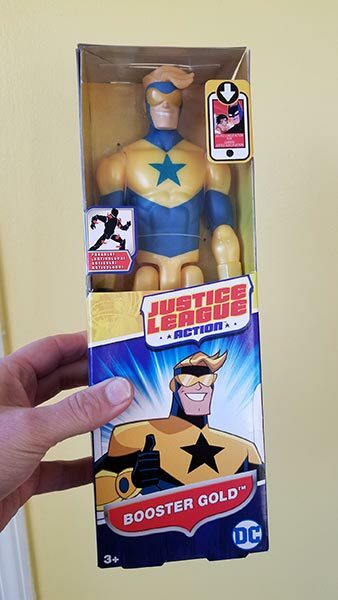 It took a year, but it looks like Booster Gold is finally available in a Target near you. (It's still unavailable from Target.com, which acts like it has never heard of any such thing.) You're running out of excuses not to have this beauty! Thanks to all Booster boosters who have reported finding the figure in their local stores. You guys are so good, maybe you can turn up one of those DC Icons JLI Blue and Gold two-packs DC Collectibles teased us with last year. If Booster Gold had three dollars and earned six more, how many dollars does he have in all? It's looking like a golden year for Booster boosters. In addition to our hero co-starring in Action Comics — another issue will be out this week! — we've also gotten several collectible figures. First came the Previews Exclusive Funko Pop Blue Beetle and Booster Gold two-pack (sold in both standard and metallic variants). Those should now be available at your Local Comic Shop. But that's not all! In addition to these other fine collectibles, Wiz Kids Games' released Heroclix Booster Golden Organized Play prize support late last month. That's right, there are new Booster Gold themed Heroclix, including Skeets! Booster is a reuse of the same sculpt from last year's World's Finest set. However, this is the first standalone Skeets sculpt in the Heroclix line (which has been making DC characters since 2002). 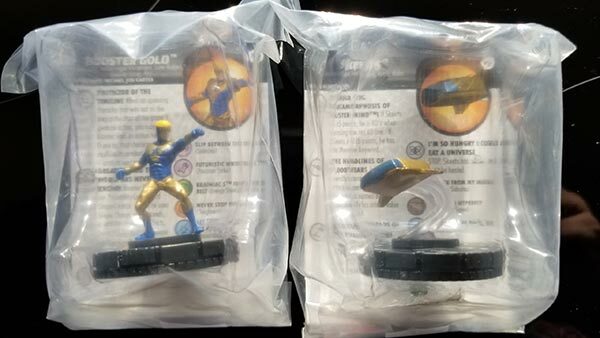 Booster and Skeets are officially available only through tournament play at authorized specialty shops, but you can probably find them for resale on eBay and other secondary markets. I hope you all have room in your collections for all the good stuff coming our way! If you had seven dollars and then spent five dollars on Booster Gold comics, how many dollars do you have left?